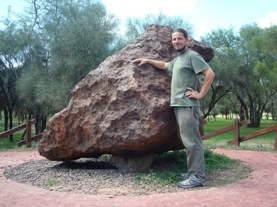 Caption: Alejandro López with El Chaco, the second-largest meteorite in the world. Argentina’s Chaco Province, a vast plain once covered by dense forest, is today home to farmland. The flat terrain, however, is not a typical agrarian landscape but rather is studded with enormous metallic meteorites and craters created by pieces of the same source rock. The region is referred to as Campo del Cielo (Field of Heaven or Field of the Sky), unique in the world for its trove of well-preserved objects from space. Campo del Cielo features 1,350 square kilometers of meteorite impacts formed 4,000 years ago when a huge metallic fireball struck Earth at almost a right angle, as if trying to make a graceful landing, at a speed of 14,000 kilometers per hour. The result was a shower of meteorites ranging in size from small stones weighting only a few grams to El Chaco, a behemoth weighing in at 37 tons and the second-largest intact meteorite in the world. Its size is second only to Hoba, a 66-ton rock that fell in Namibia no earlier than 80,000 years ago. NASA scientists have investigated the site on two occasions. Now local researchers are raising concerns about weak protection for the region’s space rock heritage. Chaco Province passed a law in 1990 to declare meteorites as being of cultural interest and part of public domain. This legislation also prohibits the export of said material out of the province and sets penalties and fines for violations. Another bill declares the meteorites are part of the province's cultural heritage. Astronomers state, however, that the controls are inadequate; some meteorite traffickers and locals ignore the site’s cultural value and remove the objects. In addition, the rules are unclear about the adjacent craters, which could hold more scientific value than the meteorites. Another concern is that the province of Santiago del Estero, into which Campo del Cielo extends, lacks similar regulations, leaving some of the material unprotected. Campo de Cielo’s bounty of meteorites is deemed by scientists to be unique. For the majority of impacts on Earth, it’s impossible to recover the entire intact mass of the meteorite, says Bill Cassidy, a researcher who studied the site for NASA in the 1960s and 2000s. So scientists often are unable to determine a meteorite’s total mass, its angle of impact and other characteristic details. Campo del Cielo, however, underwent impacts from objects of various masses coming in at roughly the same angle and speed as the original impactor broke up. This diversity allows meteoriticists to perform calculations to help them determine details about the impactor and its orbit, which can serve as models to improve the understanding of meteorite impacts elsewhere on Earth. Cassidy lately has moved on to study impacts in Antarctica but he barely scratched the surface at the site in Argentina. “They should keep studying Campo del Cielo,” he says. NASA first abandoned research at Campo del Cielo in 1969 after Neil Armstrong and Buzz Aldrin walked on the moon. There, the agency decided, it could study well-preserved lunar craters that had undergone no human or climatic impact. In 2005, however, NASA returned to Campo del Cielo to collect more data. Mario Vesconi of the Chaqueña Astronomy Association currently works at the site. He also advocates for further research there, noting predictions for future major meteorite impacts on Earth as well as a spectacular meteor entry captured by cameras in Chelyabinsk, Russia, in 2013. “If an impact like Camp del Cielo occurred in a city, we’re talking about a disaster,” he says. Studying the region’s craters could enable analyses of the incoming rock’s power, energy, speed and also help scientists better predict the consequences of any future major impact in a populated area. By some estimates, before entering the atmosphere the asteroid probably weighed 600 tons. Half that mass likely burned up on entry. Of the 300 tons that impacted, one third has been recovered. “There’s much more buried material and dispersed elements,” Vesconi says. The meteorites left two types of craters: so-called explosions and funnel penetrations. There are four of the former type, with the biggest measuring 80 meters wide and 14 meters deep. “Upon impact, the whole mass of the asteroid spread throughout the area,” he says. “If you walk through the site you’ll find meteorites.” The other type of crater resembles a tunnel. They can measure up to 25 meters long and eight meters deep, in the case of one punched by a 14-ton meteorite. Some are estimated to have struck the surface at 14,400 kilometers an hour. Vesconi says the region has always had crater conservation problems. “It’s no-man's-land,” he notes. “Despite the expropriation of the craters by the province, it never took real ownership of the land. The people still don’t value the site.” Locals at times have taken possession of its meteorites or filled its craters or built roads over them. Alejandro López, an astronomer and researcher at the University of Buenos Aires and the National Scientific and Technological Research Council (Conicet), says many of the larger fragments end up in private collections or in collections at museums and scientific institutions around the world. Small and large meteorites alike from Campo del Cielo that were taken illegally are sold online. “In the ‘90s someone even tried to take El Chaco,” López says. Although the situation has improved in the past decade with a national law and tighter control on meteorite trafficking, the site continues to be at risk and requires more protection. The Spanish conquistadors learned about Campo del Cielo from the natives. They believed the legend surrounding the Mesón de Hierro, a huge meteorite that was never found, despite several adventurers claiming to have seen it. The Criollos, South American colonists born to Spanish parents, viewed the meteorites as a source of wealth—rocks to mine for iron or silver or to serve as a tourist attraction. “They were always seen as landmarks that branded the region as a chosen land,” López says. In Gancedo, the closest town to the site, residents hold an annual National Meteorite Festival. López thinks that the site could serve as an excellent tourist attraction, provided it was well operated and involved local residents. Today the only area open to visitors is the Provincial Park of the Meteorites, which hold El Chaco and a few other objects. But Vesconi, with approval from Chaco Province, is moving things along a bit further. He is performing measurements that could be used at least to create a tourist route around some craters close to the park.